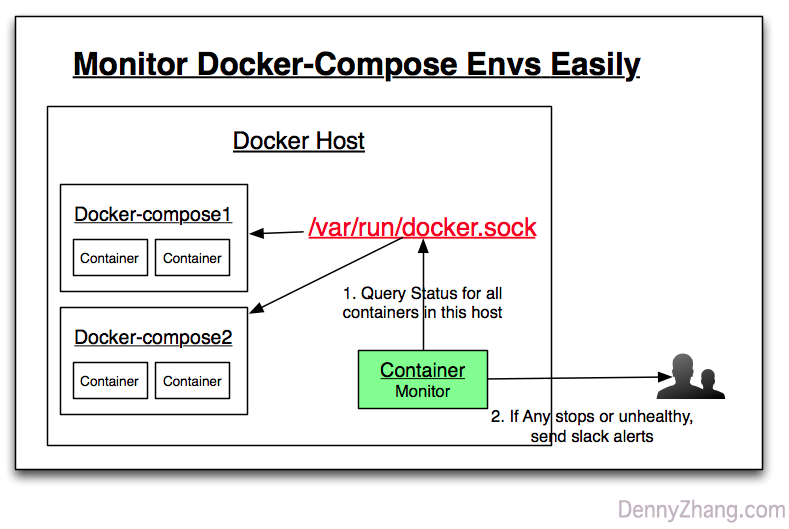 This solution works for docker-compose deployment. Please check Prometheus, for more complex docker environments. Frankly speaking, learning Prometheus took much longer than what I had expected. And it’s a bit over-killing for my scenario. Prometheus solution itself will start multiple containers. But my envs only have very few containers to monitor. 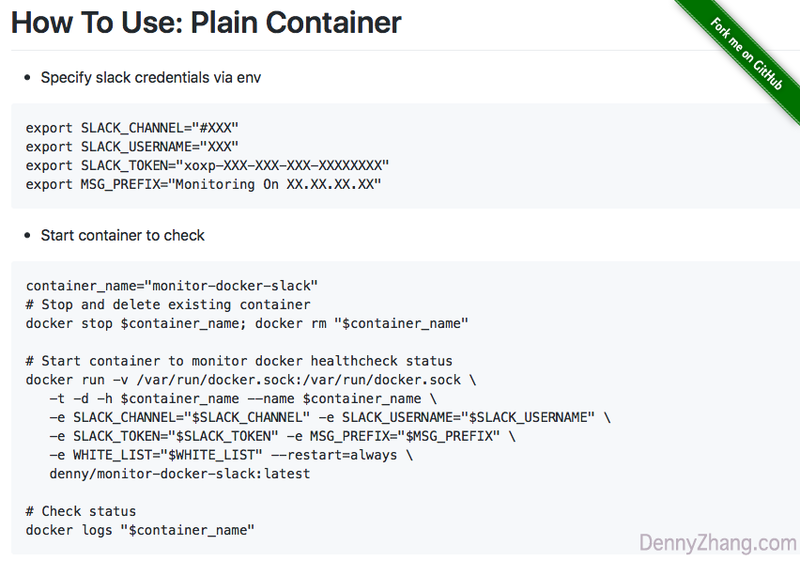 Ironically “docker ps -a” can easily answer most of my questions. To get stopped container: just check “STATUS” of each container. To get unhealthy containers: check status for “unhealthy” output. Send alerts, whenever any of above occurrences have happened. Should be easy, Right? So how about we start a container, which keeps polling status of all containers. Then send out alerts, if necessary? You may think: we won’t be able to run “docker ps” in containers. It only runs in docker host. Yes, you’re right. But there is one way out. You can query status via docker unix socket file. Try below locally, you will understand. Try it, if you find it’s useful. And discuss with me. This is very useful. I will implement on my system and update soon – working on it in some time. Share me with your feedback or experience, once you have the chance to try this approach. I love the concept, but unfortunately don’t use Slack. I’d love it if you could add smtp-based notifications? For example, you’d need to provide via ENV parameters: host, port, encryption, username, password, and target email address. This would allow alerting via IFTTT, Pushover, SMS (via mobile number email address) etc. as well as plain email. I think maybe the best place to ask is to open a “Feature Request” Issue on GitHub.